“MI FAMILIA PERFECTA” IS PERFECT!! Did you watch The Very Grand Premiere of “Mi Familia Perfecta,” the latest telenovela from Jose Spataro and Telemundo?! I loved it, and it’s going to be EXCELLENT!! You will not want to miss a minute with The Guerrero Family! But believe me, you won’t want to babysit them!! Apparently, The Guerrero Family had a mother and father at one time, but the father died, and the mother was deported five years before. When the show opens, the kids all live together on their own, with NO parents at all. and to be honest, they are kind of messy, and not very good at housekeeping. The kids are being raised by their oldest brother, El Patas, and if you ask me, he’s a pretty good older brother because he runs a burrito truck, and who wouldn’t want a burrito truck in the family? El Patas is very responsible, and wants the best for his siblings. You would think that having to raise his brothers and sisters for the past five years would have made him want to delay starting his own family? but nope. He has an AWFUL, trashy wife named Ashley who has not one redeeming quality as far as I can tell, unless you need cocaine in a hurry. And they have a son who is a toddler and wreaks havoc in every room he goes into, but that’s pretty much because his mother has two moods: Stoned and Sleeping. Ashley has a mother and sister who are exactly the kind of people you expect to find at a Trump rally, only worse. Marisol Guerrero is not the eldest daughter, but she is the most responsible and the most interesting because she may have a brilliant soccer future ahead of her, but if she keeps hiding her soccer balls in the sewer and jogging on the mean streets of L.A. before daylight she may not live long enough to try out for a team. Julian Guerrero is the kid brother who is always in trouble because he constantly breaks the law in order to support his family. While he is well-intentioned, I am not sure that throwing his younger sister Lili into traffic to stage auto-accidents is really helpful. Plus, Julian gets into a lot of fights, and steals electricity from the neighbors, so he’ll be spending a lot of time at the police station and hospitals. Lili Guerrero is the youngest sister, who is really kind of lost. She has grown up without her mother, and seems very unhappy. The best evidence that she feels that her life has no meaning is that she lets Julian push her into moving traffic to make a few bucks. Rosa Guerrero is, as far as I can tell, the WORST of the lot because she is the oldest daughter and instead of assuming some responsibility and helping to raise her siblings, she dyes her hair blonde and fools around with married men. When I was a kid, I loved my parents, but I always wanted to be adopted by the band The Monkees. The Monkees were lots of fun, were always up to interesting pranks, and every episode ended with a song. I thought living with them would be a dream come true. Until I saw The Hudson Brothers, and then I wanted them to adopt me. Clearly, I did not appreciate my parents, who might not have had a Saturday morning TV show or guitars, but they paid the bills and we always had plenty of food, school supplies, and electricity. Even if CHORES took up an inordinate part of my teenage years. I think all teenagers should have to watch the pilot of “Mi Familia Perfecta,” and then they could see what life is really like without parents. I can’t imagine anything tougher than children trying to support their siblings, and trying to keep them all going, and keep the authorities from finding out what is happening, and keep from being deported. All the while working and paying an immigration lawyer every penny to try to bring your mom back – a mother, by the way, who doesn’t seem too keen on returning, since she now has a new family in Mexico and has no intention of “Babysitting” her own kids. I can’t wait to see tonight’s episode! I think they are going to hire someone to pretend to be their mother. Again, something I might have imagined as a child. The cast in this series is FANTASTIC. It’s basically everyone who got killed off in ESDLC, including Sabrina Seara, Jorge Luis Moreno and Gala Montes. Mauricio Henao, so terrific in “Senora Acero” has cleaned up GREAT, and here he plays a Mysterious Womens’ Soccer Coach From Colombia who is so handsome the real mystery is how any of the girls focus on soccer. Laura Flores plays the Missing Mom In Mexico Who Clearly Met Someone. I’m a big Laura Flores fan, ans I have learned a lot watching her in telenovelas, and this series will be no exception. I love her here as the Mom who just might want to stay in Mexico instead of returning to that VERY MESSY house. And her five kids, a wretched daughter-in-law and a grandchild who unintentionally tries to set the house on fire. Watch for Natasha Dominguez as the BAD MOM. Jose Guillermo Cortines is almost unrecognizable in a gigantic beard, but I am so happy to see him because I adore him! He’s an excellent actor and in the series is married to Karla Monroig. They play the good-hearted neighbors who try to help the Guerrero kids, but also have their hands full with their own kids, especially their son Eddie who stays out all night riding around and drinking. And Beatriz Monroy is back as the lady the kids hire to pretend to be their mother (I think). I’m a huge Beatriz Monroy fan!! But you won’t believe who plays Mrs. Trump – El Patas’ mother-in-law – Sonya Smith! I did not recognize her and you have to see her for yourself. Maybe it is just because her character is so awful and hateful that I didn’t see the beautiful and charming Sonya Smith under her unusual and unpleasant hairstyle and makeup. This is a part we have not ever seen her in and it’s going to be DELICIOUS!!! I think she will be going to lots of rallies, and I can’t wait to see her in her MAGA hat. Don’t miss this new novela!! Author karenknnPosted on April 12, 2018 Categories Dysfunctional Families, Gringos, immigration, Learning Spanish From Telenovelas, mexico, New Ways To Learn Languages, soccer, Telenovelas on TelemundoTags Gringos, Law, Learning a new language, Learning Spanish, NBC Universo, Telemundo, Telenovelas, TelevisionLeave a comment on “MI FAMILIA PERFECTA” IS PERFECT!! Even A Simple Trip To The Grocery Store Is More Exciting In A Telenovela! 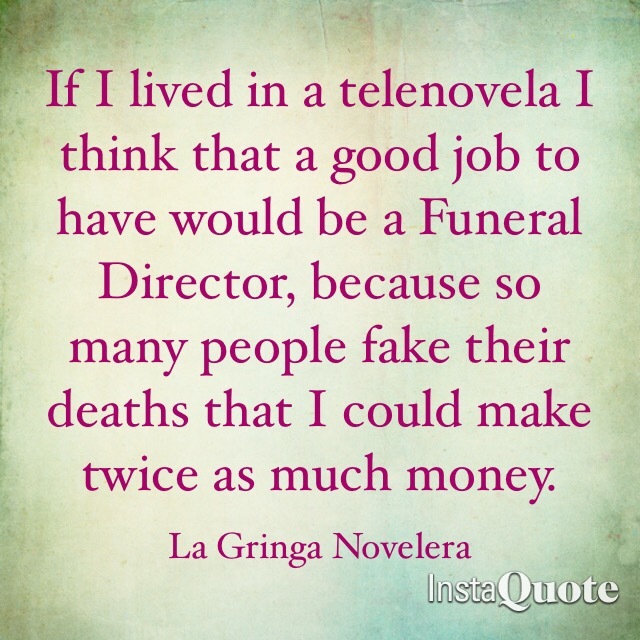 The start of the work-week can be tough, unless of course you watch telenovelas on Telemundo, in which case the start of the week can’t come soon enough!! Think Tuesdays are too tough? Every weekday is a great day if you watch telenovelas on #Telemundo because it’s just another week of mayhem and madness! In “Al Otro Lado del Muro,” Sofia is having a Very Big Week so far, starting with running into Joel at the grocery store. Of course she was at first ecstatic because she thinks that the Amor de su Vida has somehow miraculously found her at the Publix, until she realized that Joel had been convinced by a forged autopsy and lying Congressman that Sofia killed his beloved sister and the sobrino she was carrying. Paula, Governor Martinez’ personal, private henchwoman, and Pastrana, Paula’s personal, Private henchman, did an excellent job of building a fake case against poor Sofia, but Joel has disappointed me because he believed a Congressman. My rule of thumb is to do the opposite of what any Congressman says. I wish they had met up at the Whole Foods or Mariano’s, two fancy grocery stores in Chicago that have a wine and sushi bar, so that Joel could arrest Sofia under more quasi-date-like conditions. The guy to keep our eye on in all of this continues to be Patrick, Joel’s Interpol Boss and BFF. Is he part of the conspiracy or not?? Patrick is so handsome I might not care. Typically, criminals are not that handsome unless they are in telenovelas. I’ve often thought that their bad looks might account for their criminality, and maybe we should be investing less in prisons and more in plastic surgery. So as we say, the jury is still out on Patrick. Meanwhile, we are all waiting to see how Steve recovers from the surgery to remove the aneurysm that might have been keeping him from recovering his memory. However, even if he does remember he might pretend that he does not, because I’ll bet Eliza is much nicer than his wife plus she’s an excellent baker. Faking amnesia is something I’d like to try out, and I don’t know why it doesn’t happen more often. There’s really no downside when you think about it. And just how did Interpol Joel find Sofia? Not an address or even a hint of an address, addresses from prior arrests, or a list of known associates? Only lots and lots of head shots of Sofia, because she is so beautiful and was the First Lady of an Unnamed State in Mexico, so there were plenty of photo ops? Well, armed with the most flattering photos of Sofia, and a budget with apparently unlimited overtime, Joel and Patrick hit the hot streets of L.A., showing her picture all over the place. They got lucky when they showed Sofia’s photo to a woman who must have been in line with Sofia at the grocery store, because next thing you know, here comes Sofia, pushing a cart through the parking lot, just like the rest of us mere mortals. At least Joel did not wait for Sofia to unload her groceries into the hot car before he arrested her. That would have been extra-painful. Sofia could not have been happier when she thought Joel found her in the parking lot, and she was grateful that even though she had only gone to the grocery store, she had put on some lipstick and fixed her hair, remembering her mother’s advice that you should always have lipstick on, even to throw out the garbage, because you never know who you will run into. However, Sofia’s hopes for a romantic reunion were dashed quickly when Joel put her in handcuffs (although for one moment Sofia worried that Joel might be a fan of “50 Shades…, which would have been a deal-breaker). While Sofia was trying to understand what was happening, Joel was trying to get her to pipe down so he could give Sofia her Miranda rights without interruption, because believe me, if you ever try to give someone their Miranda rights and they keep interrupting you, you have to start all over again from the beginning or you will forget one. And in the midst of all of this, there was Pastrana, who appears to be the most valuable member of the Governor’s team, shooting at either Sofia or Joel, or both of them. Joel tried to capture Pastrana but he escaped with the help of two deadly Sicarios. At the police station in the Interrogation Room, Joel confronted Sofia with the accusation that she killed his sister, which is definitely a conversation killer. A stunned Sofia sat silent at first, stunned, sobbing, and of course ultimate denyied the accusation. I could have told Joel this is not the best way to start questioning someone, if you want to get anywhere. He should have offered her something to eat and drink, and a cigarette. A good interrogation always begins with good manners. But Joel was never going to get anywhere with Sofia because The Lawyer No One Called For showed up. That’s when the alarm goes off! But he left Sofia alone with The Lawyer She Never Hired. Bad bad move. Once this lawyer could not get a bond for Sofia, he began asking her about her daughter. Sofia was already suspicious of him because the day before he suggested she call her daughter. Now he wanted to know where she was, and it wasn’t to have the 10 year-old Alondra sign the contract. Sofia realized that it was her husband who hired him! Without a bond and without her daughter, Sofia will have to await trial in jail. And meanwhile, her BFF Eliza, worried that Sofia never made it back from the store, went looking for her with Andres The Carpenter. There was Sofia’s truck, and an excited bagboy to fill them in on what happened. I’m pretty sure that the groceries were spoiled by the time Eliza and Andres got there. Meanwhile, Max, married to Eliza, but Emotionally & Unlawfully Restrained by his Other Wife, Jennifer, has been stalking his family with Eliza, sitting in his car and watching them having a great time without him. And Max’s battle-axe of a wife Jennifer (who would get along great with Andres Battle-Axe of a Wife, Maria) is stalking Max. This series is Absolutely Fabulous!!! Author karenknnPosted on March 13, 2018 March 13, 2018 Categories Gringos, immigration, Interrogation Techniques, law, Learning Spanish From Telenovelas, New Ways To Learn Languages, police, Telenovelas on TelemundoTags Gringos, Interpol, Law, Learning a new language, Learning Spanish, NBC Universo, Telemundo, Telenovelas, TelevisionLeave a comment on Even A Simple Trip To The Grocery Store Is More Exciting In A Telenovela!